Some time back we discussed the tracking error associated with leveraged ETFs. Today we see another "side-effect" of these products. 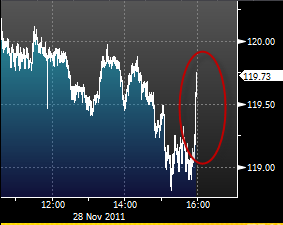 Today after a 3% rally in the US equity markets we saw a sharp upward move right before the close. One of the drivers of such a move is often a group of leveraged ETFs. Typically ETFs employ Total Return Swaps (TRS) provided by banks in order to obtain leverage. Some use futures. 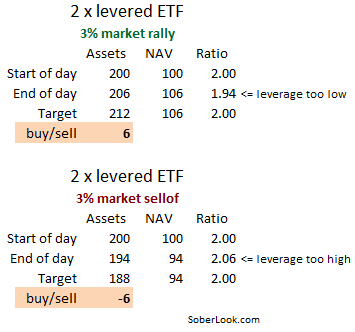 Usually on a day like today, the rally causes the NAV to grow faster than the assets the ETF holds (because of the leverage). So at the end of the day the NAV is "too big" for the assets the ETF holds, giving it less leverage than its intended target. This forces it to buy assets to get back to the expected leverage ratio. And the bigger the rally, the more it has to buy. Of course it works the same way on the down-side, with ETFs being forced to sell whenever there is a large market drop. See the example below. This is equivalent to what options traders call being "short gamma". So when you see a big spike at the end of the day, just remember it's the "retail derivatives" products called leveraged ETFs at work amplifying market moves.